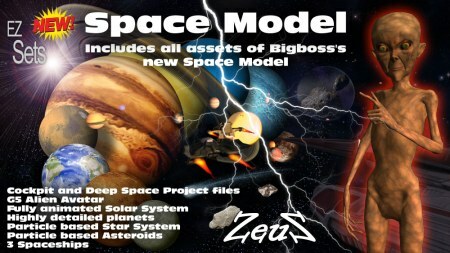 Description: This is new Space Model for iClone 3D which consist of 2 Project files for hosting Cockpit and Deep Space Scenes, one G5 Avatar for representing Male and Female Aliens, a fully animated Solar System including highly detailed planets, particle based Star and Asteroid systems and 3 spaceships with particle based engines. 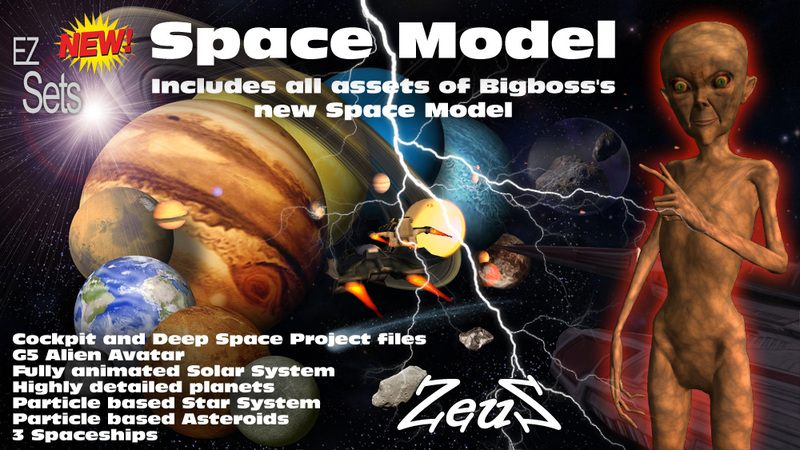 Each planet of the Solar system actually follows a near accurate representation of its relative Orbit around the Sun with texture sizes ranging from 2K and Up. The Earth has an additional animated cloud layer and a Moon. Cool. Spaceship - SciFi. Great - I Love it. Thank you Zeus, bless you.